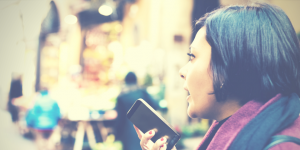 Voicemail has come a long way since it was simply a system for taking messages, and has adapted along with the devices it’s deployed to, so it’s now a must for business mobile users. Voicemail, if used properly, has the ability to enhance and improve customer experience by streamlining communications and by acting as a handy tool for busy users who may not always be able to take a call. Moving from what once was a very user unfriendly experience, requiring people to call in to listen through a host of messages before finding the one they want, to visual voicemail, a feature rich visually interactive tool, voicemail has come on leaps and bounds. With visual voicemail, not only can you select the message you want to listen to from a list, you can also get messages transcribed into text, forward messages to yours or your colleague’s email address, and record a different greeting for each of your contacts (to name a few features!). Here are a few key reasons why voicemail is so important for businesses if you use your mobile phone for work. The telephone is often the first point of contact potential customers will use when looking for a product or service. If a call goes unanswered or diverts to a basic, impersonal greeting, the potential customer is likely to go elsewhere. If a professional voicemail service is used, the company can quickly identify if they need to prioritise a call back as soon as possible. Even with the advent and ever-increasing take over of social media, nothing will ever be as personal as a phone call. This being said it is not always possible to answer every call that comes in. If visual voicemail is implemented by a business they can show off their personal approach in the greeting that plays to callers, already separating them from the competition. Lots of people believe that the quickest resolution to an issue, or the best way to find out exact details for a product or service, is by picking up the phone and getting through immediately to the person they need to speak with, where ideally they will get an answer to their question. Voicemail, if correctly used, can be an extension of the person they want to speak with, and should give the caller a clear indication of when they should hear back. For a user that has a number of questions they need to ask, or if they have multiple questions each based on the answer that was given to their previous question, only a real time conversation will do. If their first call rings out and goes unanswered they are more likely to dial a competitor rather than try again. If they are greeted with a straightforward and friendly voicemail system they are much more likely to leave a message and wait for a call back. All businesses should employ a robust voicemail system to handle customer interaction, helping with both the acquisition and retention of satisfied customers. This is why we think hullomail visual voicemail from thumbtel is a must for any serious business mobile user. Take a look here for more info and a free trial.